Over 40 eminent figures, including Nobel Laureates, members of the UN Secretary-General’s High-level Panel on Global Sustainability, members of The Elders, and top scientists, signed a Declaration entitled “The Future We Choose” on 17 June in Rio de Janeiro – a declaration driven by a collective commitment to planetary stewardship. They urged world leaders to move beyond aspirational statements and seize the historic opportunity at Rio+20 to put the planet on a sustainable path. They will present the Declaration’s message to world leaders during the High-level segment at Rio+20. Do you want to support this Declaration? The time to act is now! Please send an email to gsp-secretariat@un.org and include your name, affiliation and nationality and use “Support RioDeclaration” as the subject line. 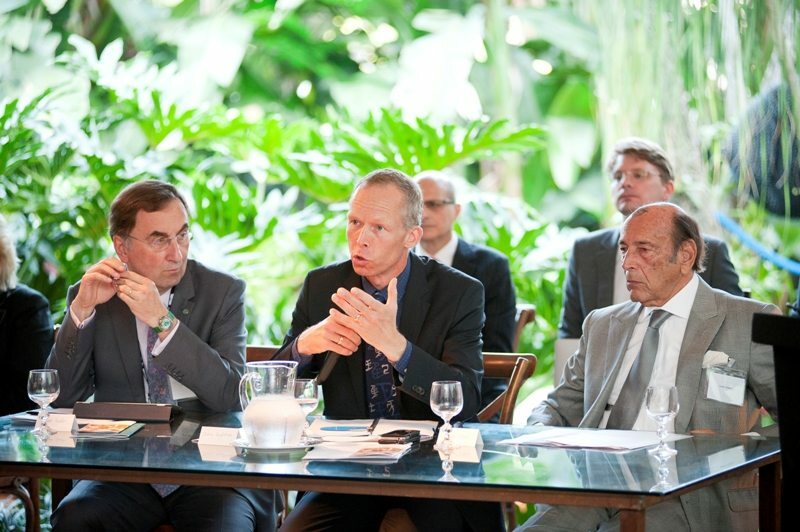 The Declaration was issued at an 18 June side event High-level Dialogue on Global Sustainability in Rio de Janeiro, organized by the UN Secretary-General’s High-level Panel on Global Sustainability, Stockholm Resilience Centre, Stockholm Environment Institute, and Fundação Brasileira para o Desenvolvimento Sustentável. As of 18 June, the Declaration has been signed by over 40 eminent figures. Izabella Monica Vieira Teixeira, Minister of the Environment of Brazil, member of the UN Secretary-General’s High-level Panel on Global Sustainability (GSP), who participated in the High-level dialogue, has also endorsed the Declaration. Among the signatories are: Tarja Halonen, former President of Finland, Co-Chair, UN Secretary-General’s High-level Panel on Global Sustainability (GSP); Gro Harlem Brundtland, former Prime Minister of Norway and former Director-General of the World Health Organization, member of The Elders and GSP; Yuan-Tseh Lee, Nobel laureate (Chemistry), President, International Council for Science (ICSU); Rajendra Pachauri, Chairperson of the Intergovernmental Panel on Climate Change (IPCC); and Maurice Strong, Secretary General of the 1972 Stockholm Conference and the 1992 Rio Conference. NextVisit Wikicurve to be part of Sustainable Development History!